On November 8, 2017, NASA released an update following a schedule review of Exploration Mission-1 (EM-1), the first uncrewed flight test of the Space Launch System (SLS) and Orion spacecraft to the Moon. 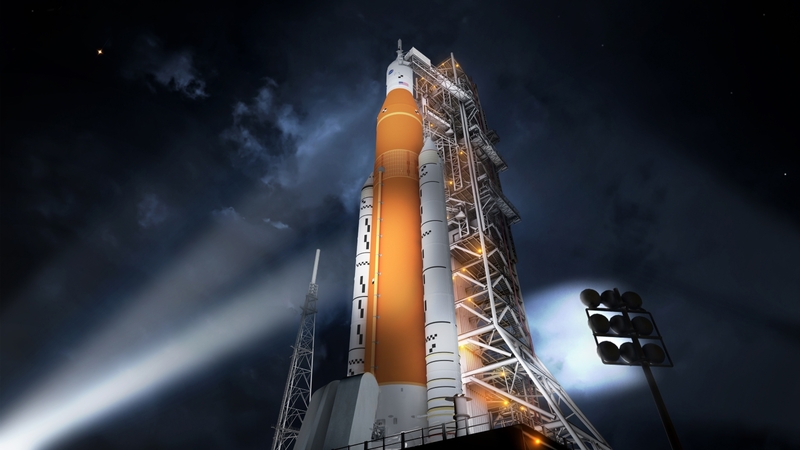 The review indicated that several challenges to parts of the integrated SLS-Orion vehicle and NASA’s infrastructure could delay the flight until June 2020; however, NASA is continuing to manage to a December 2019 scheduled launch date. The schedule review was initiated to evaluate recent challenges affecting the Boeing-led SLS core stage, manufacturing and supplying issues with the Orion service module produced by the European Space Agency (ESA), and tornado damage at the Michoud Assembly Facility in Louisiana. To address schedule risks identified in the review, NASA established new production milestones for the core stage. The agency also plans to optimize ESA’s Orion plans to keep their schedule flexible should subcontractors be late delivering hardware for the service module. On the cost front, NASA stated that it is still meeting its targets for the mission, including those for the SLS and the supporting ground systems: “The costs for EM-1 up to a possible June 2020 launch date remain within the 15 percent limit for SLS and are slightly above for ground systems.” NASA’s projected cost commitment for Orion is $6.77 billion through the first crewed mission, EM-2, which is currently scheduled for 2023. As part of this review, NASA decided to reschedule a test of Orion’s launch abort system (LAS) to occur before EM-1, now targeting the abort test for April 2019. The LAS test, known as Ascent-Abort 2, will validate the launch abort system’s ability to move the crew away from the launch vehicle safely during ascent. NASA continues to emphasize its technological prowess and progress, citing its work with friction-stir welding on the SLS core stage as well as additive manufacturing on over 100 parts of the Orion spacecraft. The agency recently completed a structural test article of the core stage’s engine section, which was shipped to Marshall Space Flight Center to evaluate how the rocket will vibrate and flex during flight. The SLS program also completed welding on all major structures of the core stage pathfinder article and is getting ready to assemble them for a “green run”. The green run test will fire up the core stage with all four RS-25 engines at the same time. All four of the RS-25 engines are now ready to be integrated into the SLS engine section. On the ground systems front, NASA’s Kennedy Space Center recently installed key launch vehicle umbilicals to the Mobile Launcher, with the crew access arm now on site for installation as well. Much depends on the SLS and Orion moving forward. Vice President Pence, speaking the Trump administration, identified their first destination—the Moon—as NASA’s first priority. I’ll probably be cursed here but, lets all be honest with ourselves, why should we be surprised with more delays regarding this disposable money eater monster? I’m only surprised the European Space Agency agreed to participate in this object lesson in procrastination. Instead of taking the next logical step and developing a crew version of ATV, its leadership chose to modify the ATV service module for NASA’s Orion capsule. I hope it was worth it and if an ESA astronaut is not on the first crewed flight – if or whenever that occurs – then Europe’s space leadership will look foolish. It’s all positive,keep pushing forward NASA ,to the moon , Mars and beyond.Commercial industry is creating competition a new space race in progress,Space X is doing great things,keep going!